Paul Krugman has done it again: From his lofty perch at The New York Times, the chief jester of the Keynesian court has wrapped a warped economic thesis in yet another comfortable quilt of misdirection. Krugman begins his deftly deceptive economic foray by citing a JPMorgan research report that estimates the launch of the iPhone 5 could add between .25 to .50 percent to gross domestic product growth in the fourth quarter. As Krugman dangles his Nobel Prize in one hand, he uses the other for a quintessentially Krugmanesque sleight-of-hand, in the form of his dismissive treatment of the money Apple spends on retailing, wholesaling and advertising—costs that are, like others, passed on to consumers in the final sale price. He seems to imply that only the physical iPhone brings value to the economy, and that the other costs embedded in the final price are so much fluff. They aren’t, and their role in boosting GDP shouldn’t be trivialized. Apple spends significant sums on these functions in exchange for real-world benefits: enlightening the public about the features and benefits of its product, motivating them to take action and then closing the sale. In many ways, these processes are as vital to the iPhone’s success as the design process. And what product’s price tag doesn’t include a host of costs that don’t convey a direct benefit to the consumer (from groundskeeping to corporate tax preparation)? Of course, given his insatiable appetite for government spending no matter what the utility (this is the same Paul Krugman who said massive government spending under the guise of a hoaxed alien invasion would be a good thing), it’s easy to see why he might be blinded to the value of real service work when he sees it. Difficult as it may be, pretend for a moment that the service component of the iPhone’s cost offers only flimsy “short-run benefits” that are largely unworthy of consumers’ dollars. Resting on that faulty foundation, Krugman’s conclusion that “the reason JPMorgan believes that the iPhone 5 will boost the economy right away is simply that it will induce people to spend more” is particularly telling. It’s telling because he derides the service contribution of the iPhone to GDP, and then declares this supposed waste is ultimately a success merely because it made the GDP needle move higher. For Krugman, then, it seems GDP isn’t a diagnostic tool, it’s an end in itself. He embraces any phenomenon that inflates the measure regardless of whether the activity that drives it is beneficial to consumers or not. In treating the patient that is the American economy, Dr. Krugman is a physician obsessed with altering the reading on the thermometer, without regard for whether his prescription fosters a healthy and lasting recovery. Is summing the nation’s output of goods and services, GDP serves to measure the health of the economy. However, a truly healthy economy is one where growth in the output of goods and services is driven by market forces—that is, the goods and services serve bona fide needs and offer real value that consumers and businesses are willing to pay for. The iPhone 5 won’t “boost the economy” in the fourth quarter merely because it boosts GDP per se. GDP is a measurement. Apple’s new phone will boost the economy because it represents a valuable good, as signaled by businesses and consumers making individual purchase decisions with their finite resources—decisions that are then reflected in GDP. An economy isn’t healthy merely because money trades hands or the GDP measure rises in a given quarter—if that were the case, the prescription for prosperity would be simple: Let the Federal Reserve print money and pay everyone to do nothing. Offered sarcastically, that credo is uncomfortably close to the nation’s policy trajectory. Forever mistaking spending per se and “aggregate demand” for real-world economic progress, Krugman’s views might be amusing if they weren’t deemed credible by the legions of politicians and pundits he and his fellow Keynesians have duped. 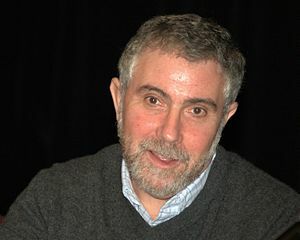 Krugman’s opinions are dangerous because they ultimately amount to an irrational call for Congress to pile on debt at an even faster rate than today—as we sit $16 trillion in the red—and they provide Ivy League intellectual cover for those who would shrink from administering the uncomfortable prescriptions our country sorely needs. For a more thorough dissection of Krugman’s iPhone stimulus theory, read Robert Tracinski’s piece, “In Krugman, Keynes Meets Orwell,” at RealClearMarkets. Regrettably, war casualties now garner scant attention from a U.S. populace grown numb and a media complex increasingly fueled by celebrity news and shallow Red vs Blue political commentary. And yet, there is another casualty of the War on Terror that receives even less attention: the devastating damage to American civil liberties. The USA PATRIOT Act. Hurriedly passed by Congress and signed into law by George Bush just weeks after 9/11, the Patriot Act undermined Americans’ 4th Amendment protections against unreasonable searches and seizures. Among other things, it empowers the government to demand financial records and telephone, internet and other communication data without court approval, lets the government obtain “John Doe wiretap” authorizations that fail to specify either the person or place to be surveilled, and—in Orwellian fashion—even infringes on the free speech rights of individuals only tangentially tied to federal investigations. The National Defense Authorization Act. Dodging public notice as best he could, Barack Obama quietly signed the NDAA into law last New Years Eve in the quiet of a vacation home in Hawaii. The trouble lies in Title X, which codifies broad executive claims of the power to militarily detain, without trial and without a time limit, anyone suspected of being a member of Al Qaeda or the Taliban or—vaguely—“associated forces,” whether overseas or on American soil. The vague language also snares those who are considered to “substantially support” them. Ominously, there is no exception for American citizens. And remember, none of these determinations is subject to court scrutiny, and those who are detained have no right to contest their confinement or, as South Carolina Senator Lindsey Graham grotesquely celebrated–a right to speak to an attorney. Executive Branch Executions. Is there any greater example of tyranny than a president who has the unilateral and unchecked authority to execute anyone anywhere in the world, including his own citizens? As first documented by The New York Times, President Obama, restrained only by his conscience, conducts secret meetings (with participants that disturbingly include political advisors), pores over secret evidence, and then orders secret killings—all beyond the scrutiny of the courts or anyone else. His Majesty’s fatal touch has already extended to at least two U.S. citizens, one of them just 16 years old. Most of these executions are carried out by drone strike, sometimes—borrowing from tactics associated with terrorists—followed by strikes on rescuers and funerals. Who Are the “Bad Guys”? 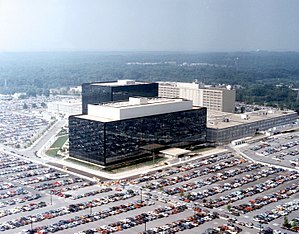 NSA Headquarters at Fort Meade, Maryland. There’s the rub: While these law-abiding citizens may understand “bad guys” to mean terrorists, their definition is utterly irrelevant. Without due process and legislative and judicial checks and balances, the American people have no say in determining who the bad guys are. In this dangerous new era, that decision is solely left to the President and his executive branch appointees. The erosion of civil liberties has gone largely unnoticed by Americans, thanks to a mainstream media that has largely abandoned its duty to keep a watchful eye on the nation’s institutions. That’s why it’s incumbent on each of us to enlighten our fellow citizens, dissuading them from trading liberty for a false sense of security in the midst of a vague and endless War on Terror. If our generation acquiesces in the destruction of our Constitutional safeguards on the flimsy basis that we, as law-abiding individuals, have nothing to hide and everything but the government to fear, we’re condemning our children and theirs to a dismal fate.